Get 2 rifles for the price of one! Includes .177 caliber and .22 caliber barrels. Each RS2 barrel has a ported muzzlebrake, which gives you an extra cocking advantage. A Beeman 3-9x32mm scope will help get the most amount of accuracy possible from the gun. Everything fits neatly inside a soft foam-lined carrying case. Velcro tie-down straps secure the barrels, gun, scope & rings to stop things from shifting during transport. Max velocity in .177 is 1000 fps, and in .22 it's 830 fps. 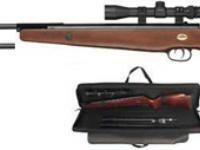 You could use this rifle for plinking, small game hunting, shooting cans and just plain fun! Don't forget to pick up a variety of recommended pellets, which are listed in the AMMO link. Select appropriate accessories by clicking on the ACCESSORIES link. What others should know: I BLUE THREAD LOCKED ALL SCOPE MOUNT SCREWS AND BARREL SCREW. 100 PLUS ROUNDS, CLEANED BARREL (.22)AND JUST FIRED ANOTHER 50 SHOTS AFTER A FEW ELEVATION CLICK ADJUSTMENTS. VERY ACCURATE, VERY HAPPY. PAID $129.00 APRIL 2011. BEAUTIFUL GUN FOR PRICE. NO COMPLAINTS ABOUT TRIGGER, SCOPE, ETC. CAN HIT DIME SIZE TARGETS AT 25 YARDS OVER AND OVER AGAIN. TIP: PUT RIFLE REST AWAY AND USE ONE PIECE SHOOTER REST SANDBAG, YOU WON'T BELIEVE THE DIFFERENCE. What others should know: Clean the barrel,break in including setting the scope and shoot 50 rounds.Clean again only use denatured alchohol and dry using a bore mop untill it shines.Readjust the scope if needed and fir another 50 rounds.If your not getting .24 inch groups, or less , by now your holding the rifle to stiff. Relax and dont grip her like a conventional weapon cause if ya do shes gonna move.Springers move before the lead leaves the barrel unlike a powder loaded weapon.Relax dont hold the front, let it rest in the palm of your hand and keep the buttstock at a minimal firmness. see the artillary hold comment on this site. Hope this was a help cause I look for comments like this to help me . This gun is HEAVY right out of the box. Crosman & Daisy DO NOT make a quality pellet suitable for this type of airgun. Both calibers will be inaccurate & waste your $5.00 per tin. I used them & was about to return the gun. 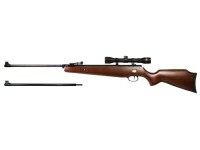 I explored GAMO hunter & GAMO magnum in the middle heavy range of .22. Driving tacs @ 50 ft instantly.. Things I liked: A beautiful gun. Finish on both wood and metal spotless. Barrels chang out in seconds. Both calibers will shoot under a 1/2" at 20 yards with open sights. I put a 4x scope on it, put the .22 barrel on it and it often puts two pellets in the same hole at 30 yards. So far all I've tested is Crosman Pointed and Benjamin hollow points. This thing shoots HARD!! I am very pleased with this air rifle! Things I would have changed: Not much, maby one with a synthedic stock. What others should know: Check the barrel set screw often.